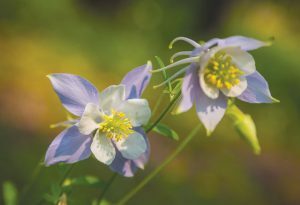 The Crested Butte Wildflower Festival (CBWF) kicks off its major events this week, July 7 through July 16 and once again the flowers are putting on a spectacular show. The height of wildflower season is unforgettable and with so many species and colors, it is the reason we are the designated the Wildflower Capital of Colorado. The festival features an array of events that goes beyond blossom gazing to encompass birding and butterflies, all mediums of art—block printing, water colors, plein air, journaling, photography, jewelry making—and garden tours and lectures in geobotany with scientists from the Rocky Mountain Biological Labs (RMBL). There are hikes, walks, jeep tours and treks to help you learn to identify the wild edibles and how to use them in cooking or make aromatics. Dr. David Inouye, a research ecologist from the University of Maryland, has spent more than four decades of summers at RMBL in Gothic. He explains how the past winter’s epic year of snowfall affected the wildflower bloom this year. “Despite the heavy snowfall early in the winter, we ended up with about an average amount of snow for the winter, so snowmelt date was about average. That, plus the fact that we didn’t have a hard frost in early-mid-June this year, means that there wasn’t much damage to the wildflowers. So it’s a pretty good year for many species, including the lupines that are close to peak now in Gothic, and aspen in Crested Butte,” he said. He warns that if we don’t get some rain soon, the later flowering may be negatively affected. Dr. Inouye says it’s an exceptional year for the corn lilies (false skunk cabbage), but explains that it’s a reflection of weather conditions of two to three years ago. “Higher up,” he explains, “it’s a pretty good year for monument plants [green gentian], although that is a consequence of a relatively wet July and August four years ago.” In an interview from 2014, Dr. Inouye noted that the wildflower season had increased by 35 days since the 1970s. Bivens is excited about the new events, one of which is An Evening with the Wildflower Scientists at RMBL, where registered participants will enjoy a fabulous dinner at RMBL’s new dining hall and afterward go on a walking tour of Gothic, followed by short wildflower presentations by the RMBL scientists who will talk about their research. The dinner presentation is July 10, from 6 to 9 p.m.
Also in collaboration with RMBL are the geobotany tours, Geobotany of Crested Butte with instructors Dr. Amy Ellwein and Dr. Tim Lowrey, who will talk about how geology influences the distribution of plants around Crested Butte. The tour combines both walking and driving and focuses on plant identification, how plants adapt to their environment, and how they are distributed via geology and topography, with lots of humor thrown in and very little science jargon. In another of the geotours, Geobotany of Paradise, instructors Dr. Jeff Delaney and Dr. Tom Zeiner will explain how glaciers carved this south side of the Elk Mountains into the most scenic valley in Colorado, and they’ll also teach about the coal and minerals that attracted the early settlers. The tour features a walk through wildflower-filled meadows and woods. Another new event this year is Cocktailing into the Wild and features Brianna Wiles of Rooted Apothecary in Crested Butte. The class will teach participants the art of making different concoctions like bitters, syrups, and elixirs, using the aromatics of nature. Although the 4×4 Jeep tours aren’t new, they’re a big hit and everyone’s favorite, Bivens says. The tours head out twice a day, every day from July 7 to July 16, and continue after the festival on Friday, Saturday, Sunday and Monday through August 14. Bivens advises to book early because they all sell out. Every Sunday, the CBWF offers a Wildflower Walk, all through July and into August. At the Festival’s headquarters in the Crested Butte Community School, visitors can find nature-inspired merchandise at the CBWF’s Blossom Boutique, from cards, posters and handmade items to art and jewelry. “It’s already a great season and the flowers are looking great. We’re really looking forward to it,” Bevins says. Because of the wet snow year and melting pattern, the wildflowers are abundant and just beginning their amazing performance as they climb up from the lower elevations to the high country. Pick up a copy of local author Kathy Darrow’s book, Wild About Wildflowers: Extreme Botanizing in Crested Butte, grab yourself a map, pack your rain gear and lunch, plenty of water and sunscreen—and don’t forget the mosquito spray because they’re hungry this time of the year—and set out to discover the wildflowers. You needn’t go far, as some of the best shows are just on the outskirts of town and you can walk there. Head for the Lower and Upper Lower Loops for an easy hike with superb views. The area around Peanut Lake is always delightful. Take a drive to Gothic and visit RMBL visitor center, and grab an ice cream, or an excellent cappuccino at their Science Café next door. Heading up Kebler and Ohio Passes will be stunning as well. But better yet, it’s even more fun to share the experience and gain a deeper knowledge from one of the Wildflower Festival tours because their instructors and guides are well versed in whichever event you sign up for. Wherever you hike or drive, there’s a canvas of jagged mountains swathed in green foliage against red-faced or shadowed outcroppings to captivate the spirit. In places too precarious to walk, a single cluster of yellow, purple or pink atop its rooted greenery will set off a rusty-colored scree field. In this impossibly beautiful landscape you can’t go wrong on any path you choose to take here in Crested Butte. Finally, and most important, it’s imperative that wildflower admirers know to stay on the roads when driving, and not drive onto delicate grounds, fields or private property, especially up at RMBL, and also about the significance of not picking the wildflowers because when people pick the flowers, they’re diminishing the next generation of plants and blooms and taking wildlife nutrients from deer, bear, bees, and other pollinators—whatever eats those flowers or whatever eats what’s eating the flowers, it’s all connected in a cycle. So please, enjoy our wildflowers, but leave them where they belong—in the wild—and leave the wilderness as you found it, with no trace of your having been there. For more information and a full schedule, a description of events or to register visit the website at crestedbuttewildflowerfestival.com or call the Crested Butte Wildflower Festival office at (970) 349-2571. The Crested Butte Wildflower Festival headquarters during the Wildflower Festival week is at the Crested Butte Community Schools. After that, you can find them at their new office at the historic Depot, 716 Elk Avenue. For more information on the Rocky Mountain Biological Laboratory, their events, lectures and research in Gothic check them out online at rmbl.org.